It's also great fun to work with large scale prints! Wallets call for more dainty and delicately scaled fabrics but these bags can handle broader strokes and brighter colors. They'll be available in my etsy shop in the next week. Congrats on your downsizing. The one in the middle is my favorite. 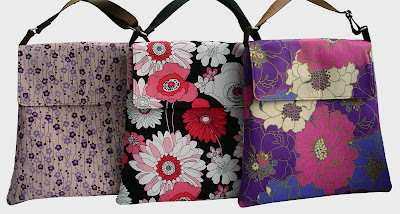 I LOVE the fabrics you choose for your bags! Nice new shape.